We had a catered party a couple of weeks ago and the chef was a Tunisian named Sami. 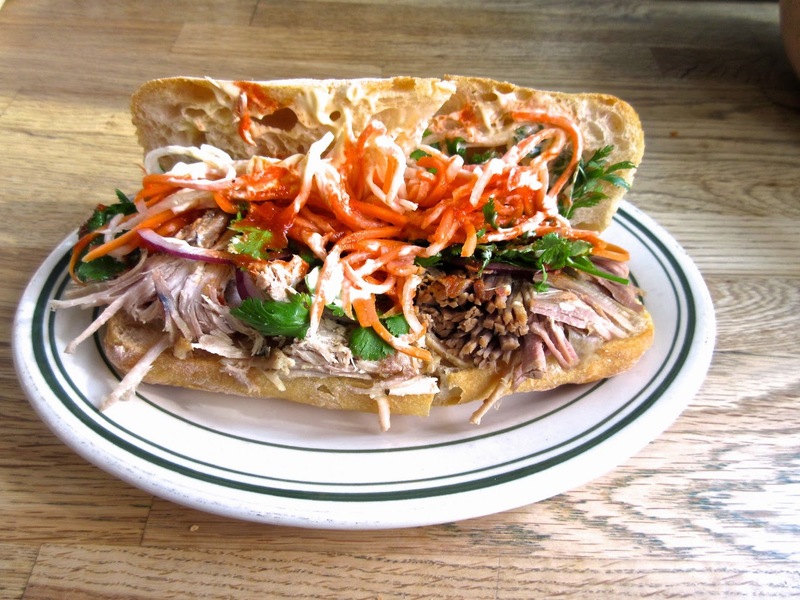 We talked a lot about food, and about great products and where to find them. He told me to go to SOS Chefs, in the East Village, and tell the lady that Sami the Tunisian chef sent me. So I finally made the journey to Avenue B between 6th and 7th Streets today, and it is quite a place! As Sami said, the range and quality of the spices is amazing, but please note that they charge for it. I was helped by a lovely young woman who kept bringing me spices to try, and of course I ended up buying a number of them. When I introduced myself to the owner, who it turns out is also Tunisian, I was treated to a tour of the mushroom room in the back, where a huge variety of mushrooms are stored pending orders by New York's chefs. 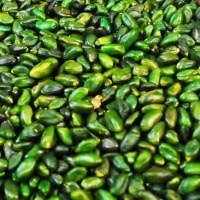 Also nuts and other perishable items: I drooled over the Sicilian pistachios, but was able to resist them due to the $100 per pound price tag. 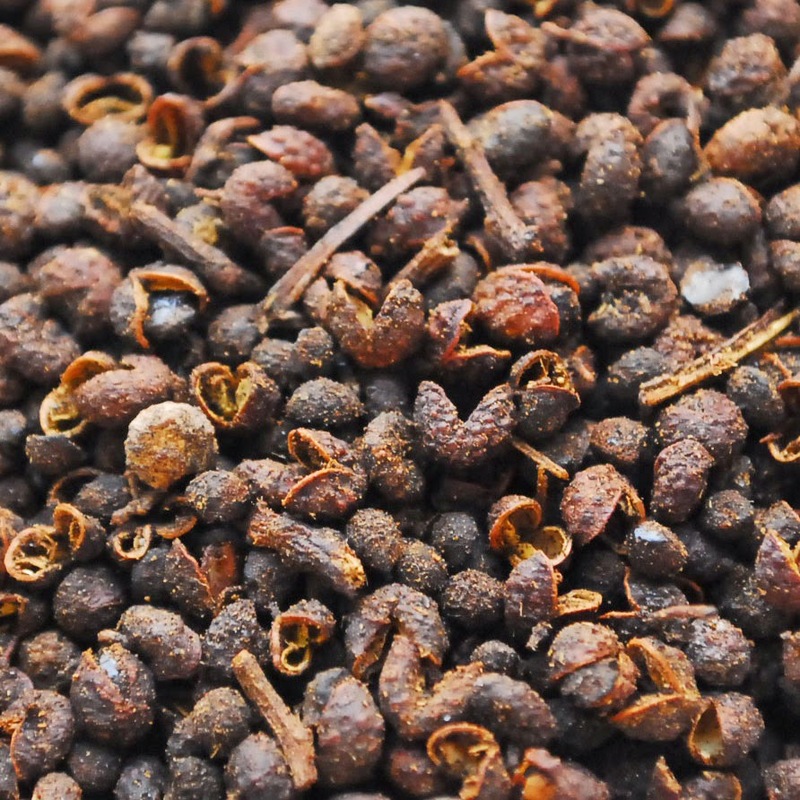 I did indulge in some Nepalese Timut pepper, of which I tasted a single grain and enjoyed a tingling tongue for 20 minutes, rather like a cross between Szechuan and black pepper. I'm really looking forward to using it, and it is already loaded into a grinder. The other spice I bought were ones that I needed or bought in order to upgrade my existing pantry, like incredibly fragrant Aleppo pepper that blows the stuff I had away. And I was talked into a head of pungent black garlic, which I must figure out how to use. 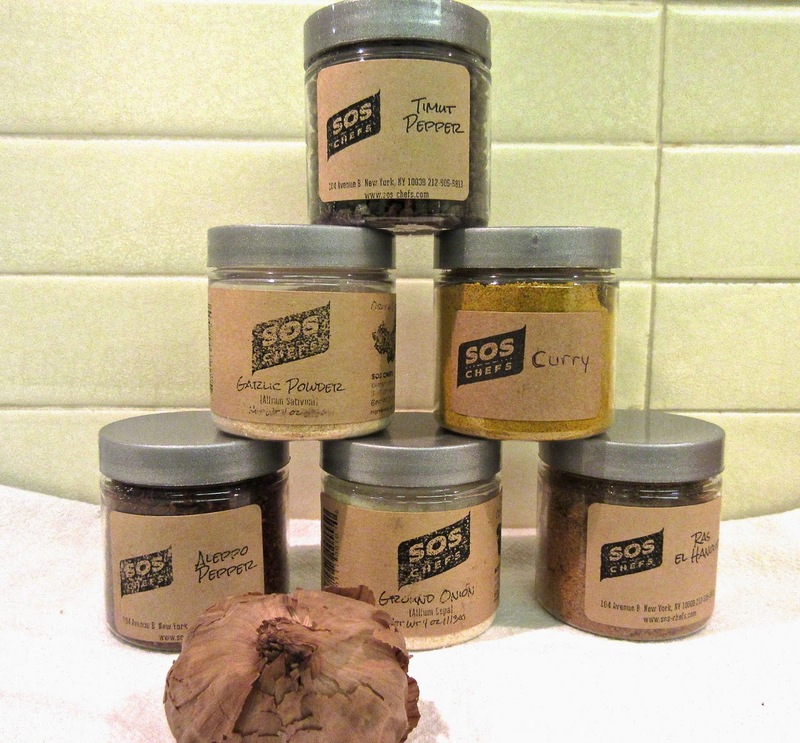 SOS Chefs also has a great selection of grains, oils, pastas, beans and other items that I am forgetting. A long way to go from the Upper West Side, but a fun visit. On my weekly pilgrimage to the Upper West Side greenmarket behind the Museum of Natural History, I noticed a new stand: She Wolf Bakery. They had a case full of miches, a brown sourdough (levain) bread similar to the famous Pain Poilâne made in Paris and marketed throughout the world. I bought a quarter loaf and couldn't wait to try it at home (the piece below is substantially carved down from the quarter miche). 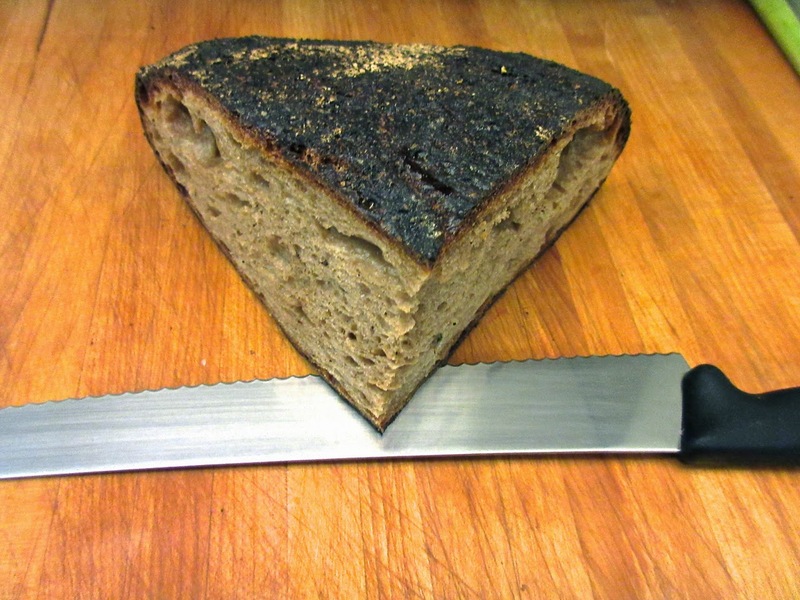 It is intensely sour but gives full reign to the flavors of the white, whole wheat and rye flours of which it is made. 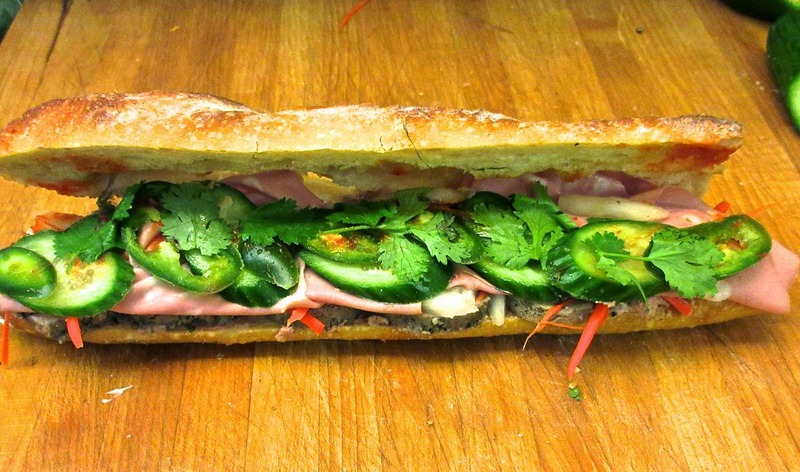 In short, a revelation, better in my opinion than the renowned Parisian loaf. The crust is crispy and the crumb delightfully moist, a triumph of the baker's art, as you can see below. 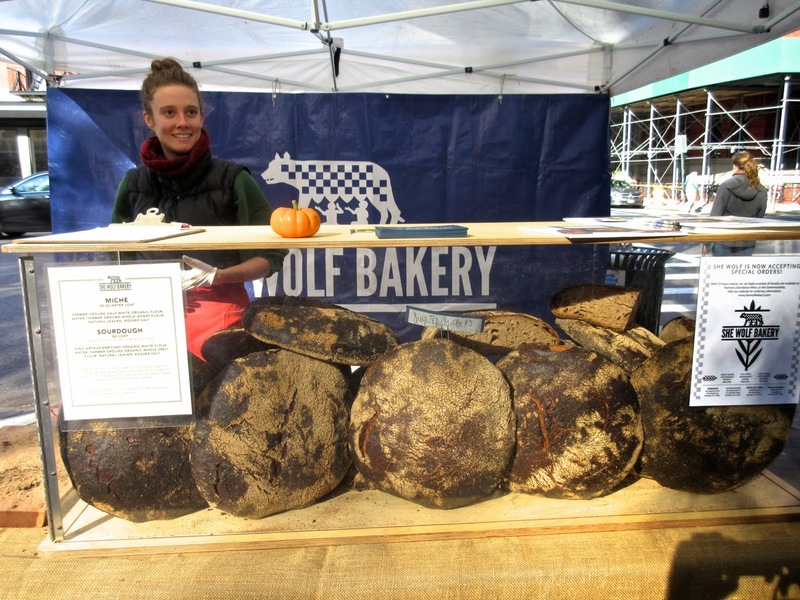 Based in Greenpoint, Brooklyn, She Wolf makes other breads, but I didn't see any of them today. The bakery has a stand at the Union Square Market on Mondays, so I will have to check it out. They are also at the Greenpoint market for those who live in or near that neighborhood. Get this bread if you can! A couple of weeks ago, I was buying Ronnybrook milk at the farmer's market behind the Museum of Natural History, when the person in front of me asked for coconut yogurt, exclaiming "I love this stuff, it's amazing!" So I said that I'd have what she was having, and had a great surprise: it really is wonderful. The taste and texture of the coconut flakes are subtle but combine with the sourness of the yogurt to produce an almost-dessert product that's great by itself or to elevate fresh fruit. There are two problems with Ronnybrook's coconut yogurt. First, it is hard to find. Second, it is made with full-fat yogurt, and many people (me included) prefer low- or no-fat yogurt. 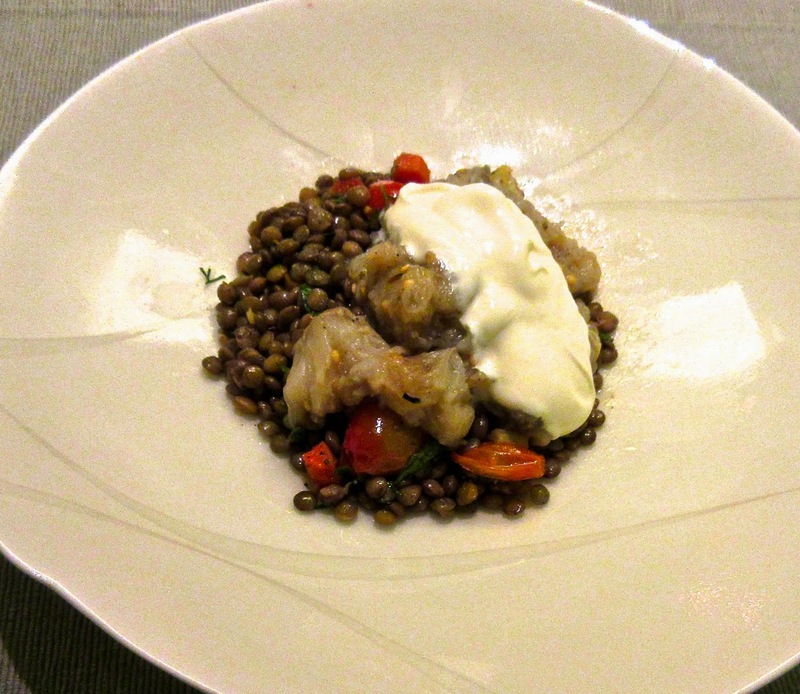 So I set out to try to make my own with store-bought Face Greek-style yogurt and with my homemade 1% yogurt. I thought it would be difficult to find just the right proportion of coconut to yogurt, and also asked myself whether to use sweetened or unsweetened coconut flakes. It turns out that my first trial was a success: 90 grams of Greek yogurt, 10 grams of sweetened coconut flakes. This ratio also worked for my homemade yogurt, even though it is considerably more tart than the Greek-style. Obviously, you can use more or less coconut according to your taste. 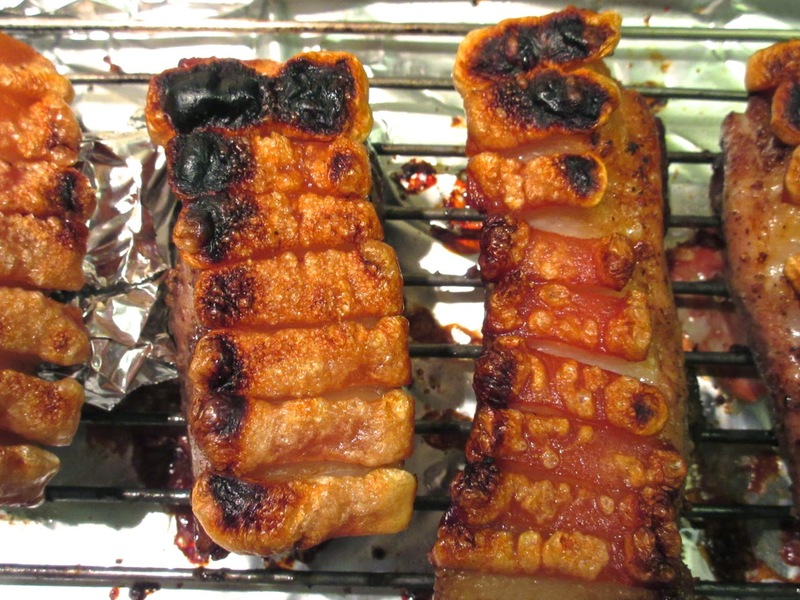 Just to be sure, I tried using unsweetened coconut flakes, which provide the texture but not the satisfying sweetness. While adjusting with sweetener could fix this, why bother? 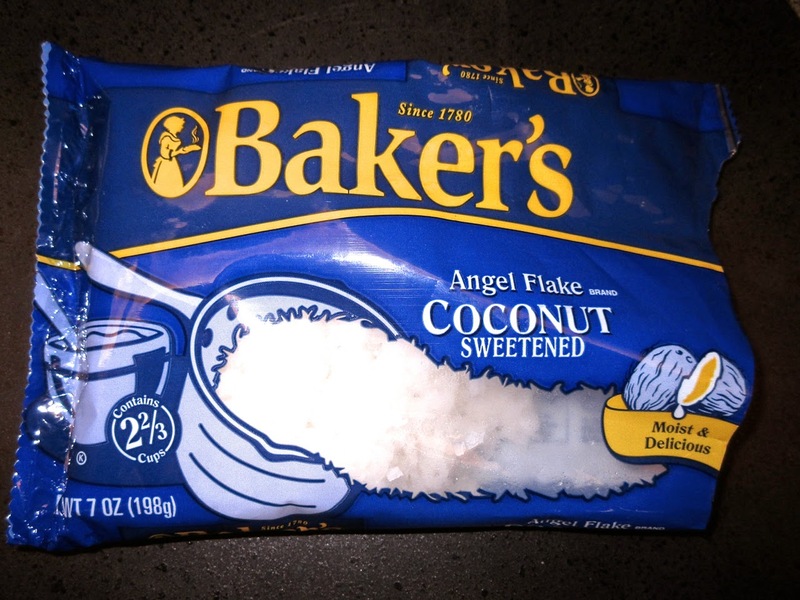 Just stick with the readily available sweetened coconut flakes. 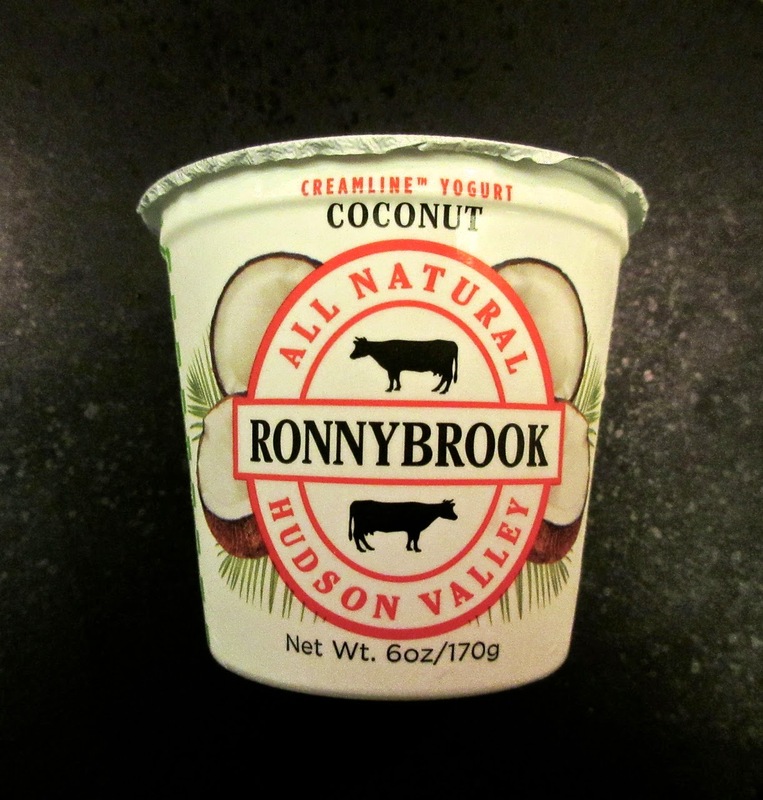 If you can get it, try Ronnybrook's coconut yogurt. Otherwise, make your own. J is a dealer in contemporary Japanese ceramics and in the course of her (and sometimes my) travels to Japan, she has found some beautiful dishes and bowls that are meant to be used, not just admired. I love using them with Western food, which can be challenging because the artists were seeking to make vessels that suit Japanese tastes in food and presentation (including size). When it works well, I like to think the artists would be pleased that their work can be used in ways that they never contemplated. 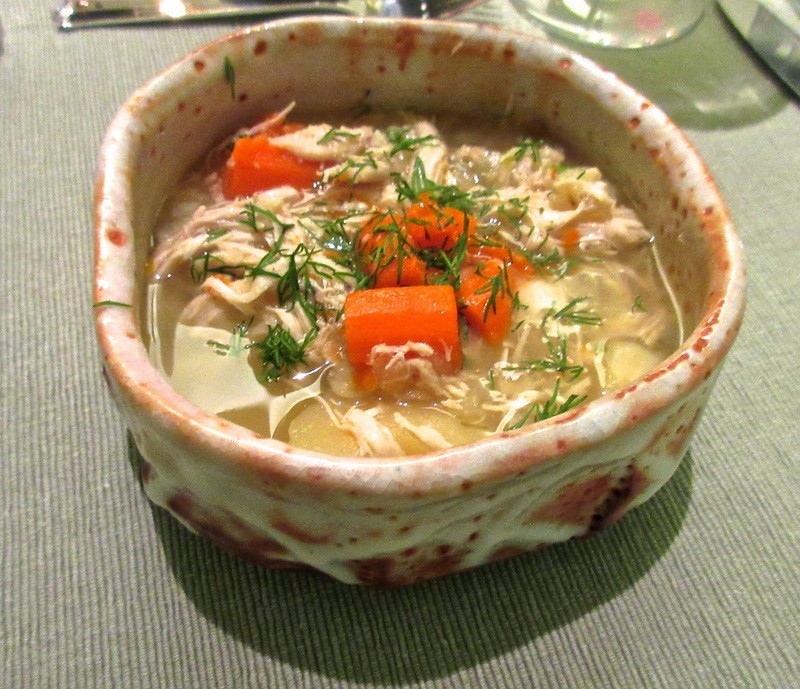 Joan was particularly taken by this presentation of chicken soup in bowls by the late Kato Yasukage.